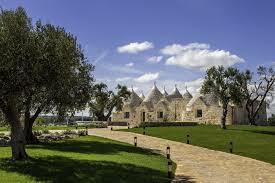 Day 1 ~ Welcome to Puglia! Arrival at the Brindisi Airport (or train station) – Your driver and I will greet you at the Brindisi Airport and/or Train Station. Pick up at the airport and train station is at 3:00 pm. Check in villa is at 4:00pm – unpack, get settled in and check out this spectacular villa. Welcome cocktail and appertivo poolside. Dining al fresco family style sampling the local cuisine. Morning at your leisure, take a walk in the countryside, lounge by the pool or read a book. Pizza making class in our own pizza kitchen for lunch. In the early evening we will be picked up at the villa by our personal driver and make our way to the White Washed City of Ostuni. Then not a far drive to the town of Carovigno to visit Chef Theresa Boungiorno and her Michelin Star restaurant for one amazing dinner. Attention to detail on every plate, and the flavors just dance in your mouth. We’ll depart the villa around 9am for the coastal town of Monopoli. Here we will pick up our private boat and cruise the Adriatic. Jump off and take a swim, drink some Italian beer and prosecco. Bring your camera’s for some photos. Lunch will be on the boat. We’ll pick up some fresh seafood and head back to the villa. Seafood Pasta Scannaturi Class with fresh pasta and assorted seafood we will cook on the grill and in the pizza oven. A delicious and fun evening for everyone. Relaxing morning at the villa. You will have the morning free. We will travel to the Baroque town of Lecce. Often referred to as the Florence of southern Italy. 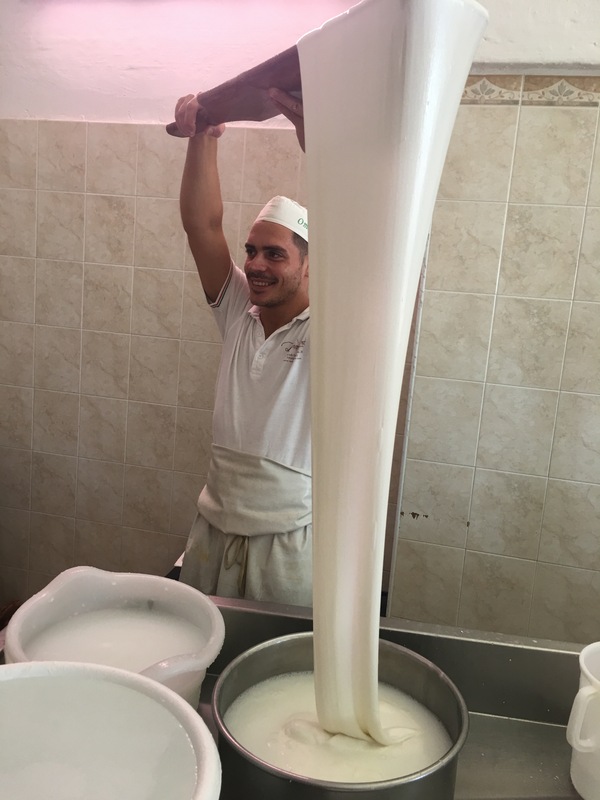 Lecce holds a special place in my heart, after culinary school I spent some time here and fell in love with Italian cooking. Lunch is on your own in Lecce. Donna Oleria is not a far drive where you will meet our friends Francesco & Grazia. You will experience southern Italian hospitality at its finest. Some of the best olive oil you will ever taste followed by a traditional Puglian dinner, with a “pizzica band” and dancing to finished off the evening. This has been one of the highlights from previous travelers. Morning tour and demonstration of Burrata making. Who doesn’t love burrata? Tasting of local meats & bread with fresh made burrata. Today we’ll drive toward the Ionian Coast to the town of Manduria to visit one of our favorite wine producers Gregory Perrucci. 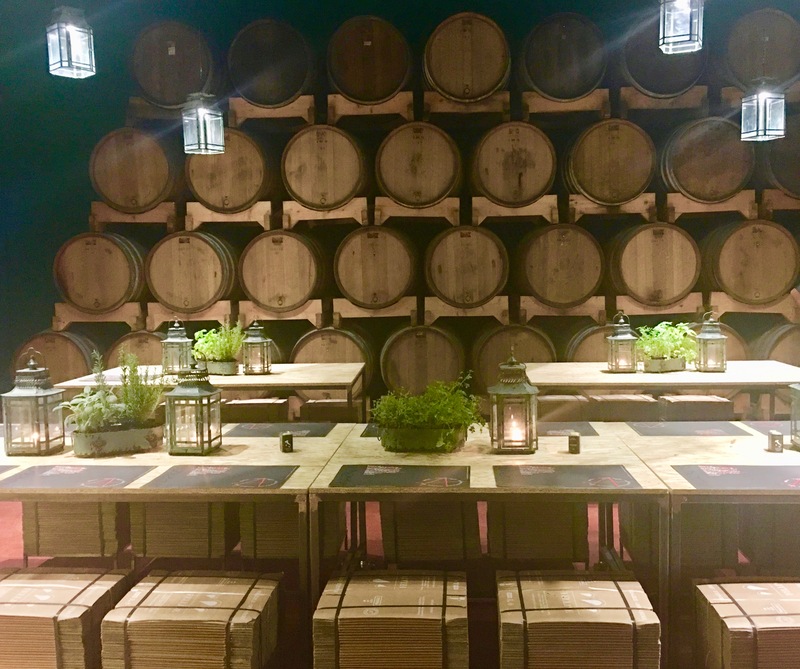 Gregory has just restored his grandfathers old cantina and has created the most beautiful space for wine tastings and special events. If we ask nicely I think we can talk him into playing his baby grand piano. A highlight of this adventure not to be missed. Included will be a tour, wine tasting and lunch or dinner. Relaxing morning at the villa. In the afternoon we will head to Cardonne Winery just outside of Locortondo and visit our friend Marianna for a winery tour and tasting. 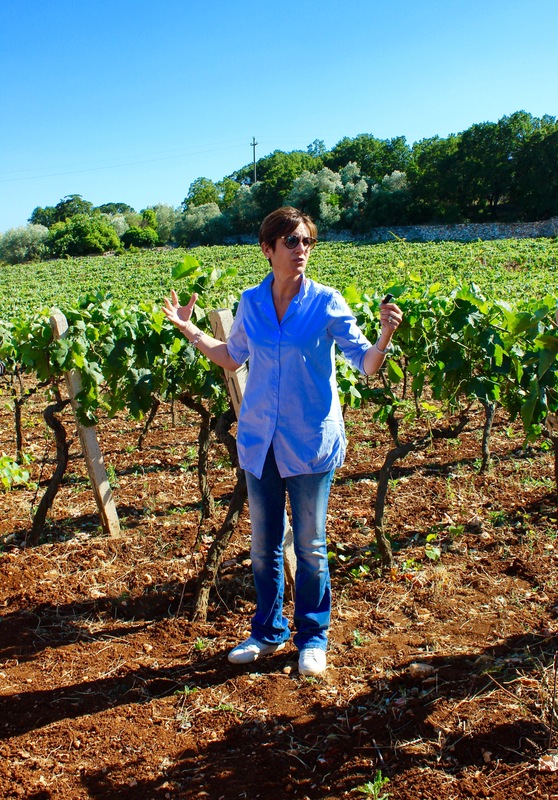 Mariannna is quite passionate about her families winery and wines with very good reason. I think you will enjoy and find a new favorite. 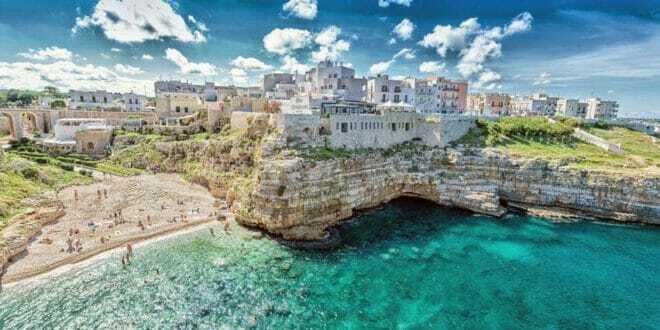 Next we will travel to Polignano a Mare a beautiful little town perched on the rocky cliffs of the Adriatic. This is where Domenico Modugno famous for “Volare” lived and wrote this famous song. You will have the evening to yourselves. Time for shopping, appertivo and dinner of your choice. We have some recommendations on some favorite restaurants. You will be on your own for dinner this evening. Morning pick up from the villa, bring your swimsuits, sunglasses & sunscreen. 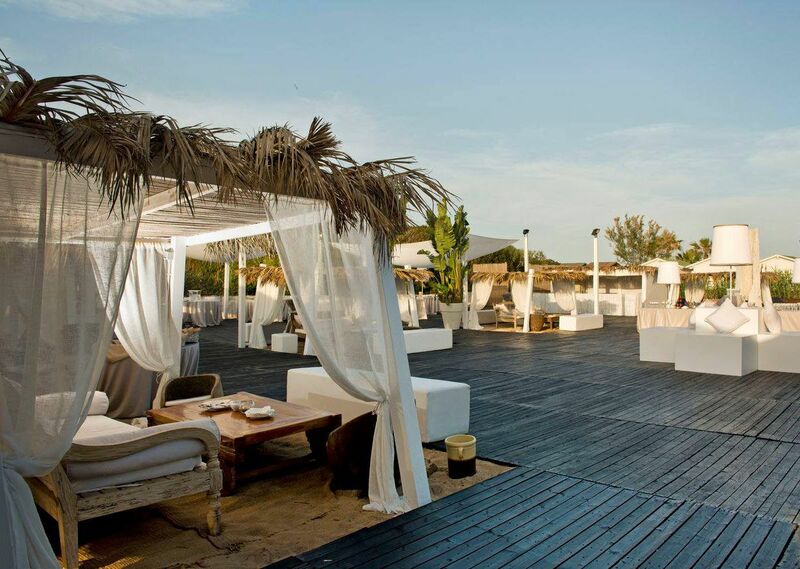 This is your time to enjoy one of the most beautiful beach clubs in Puglia. The seafood lunch is absolutely one of the best. Evening you will have time to pack and enjoy a farewell cocktail party & dinner. Right after breakfast, we’ll say our goodbyes to our new family at the villa, our drivers and the spectacular region of Puglia. Your private transfer will leave at 9:am from the villa to the Brindisi Airport or train station. ***Sequence of classes, activities, excursions and menus may vary. The final itinerary will be given to each guest on the first day of the vacation. Whenever there are local festivals or events happening during the week, we will try to include them with adjustments to the itinerary to enhance your vacation experience. How soon will you be looking for a deposit? Pam I have two weeks already booked. I am taking names for adding a possible 3rd week. Please add my name….. thanks! This sounds heavenly and we’ve seen how beautiful Polignano is . Do you have dates or prices you can share? Kim two weeks are booked and I am taking names for a possible third week. Thank you Lana…. 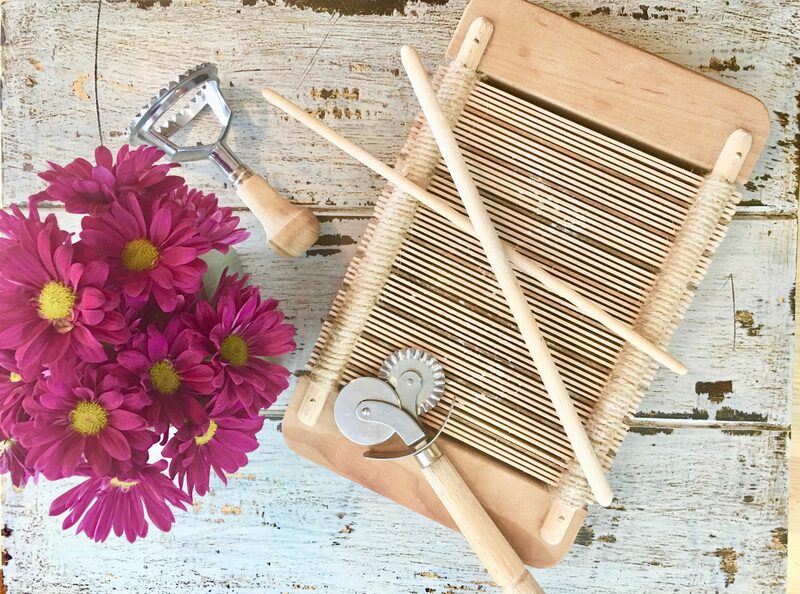 it’s been a labor of love..